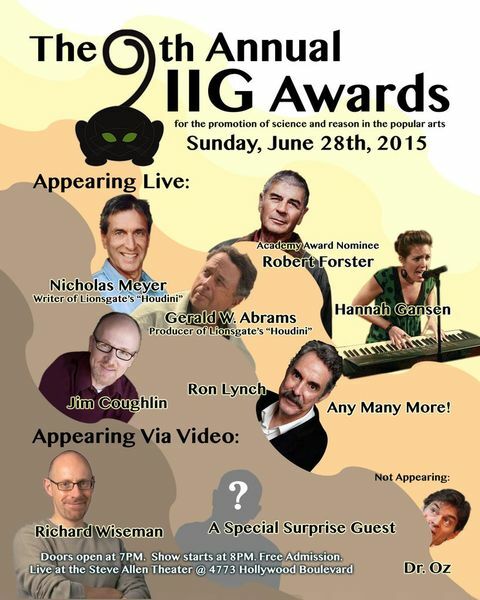 The Independent Investigations Group (IIG) will be holding their annual awards ceremony recognizing the promotion of science in popular media on Sunday June 28th at the Steve Allen Theater at the Center for Inquiry-Los Angeles at 4773 Hollywood Blvd, starting with a reception starting at 7 PM. Admission is free although donations to support the event are welcome. The awardees include TV mini-series Houdini from Lionsgate Television, and the feature film Going Clear: Scientology and the Prison of Belief from HBO. Presenters of the awards for 2015 include comedians Hannah Gansen, Jim Coughlin, Ron Lynch (Bob’s Burgers, Adventure Time), and Academy Award nominated actor Robert Forster (Breaking Bad, Jackie Brown). Also in attendance will be representatives of the winning shows including Gerald W. Abrams and Nicholas Meyer, executive producer and writer of Houdini, and others. A special honor bestowed by the IIG for exceptional achievement is induction into the Houdini Hall of Honor. This year’s inductee is Richard Wiseman — psychologist and charismatic science advocate — who will be appearing via video. His name joins Harry Houdini, Carl Sagan and others. Also being recognized this year is the series The Dr. Oz Show. This show will receive the “Truly Terrible Television Award,” given each year to programs that promote pseudoscience or belief in the supernatural.